Is polo finally ready to embrace "the team"? You might say "who cares" or "haven't we already" but i think think it's an issue that deserves a bit more light than those responses assume. 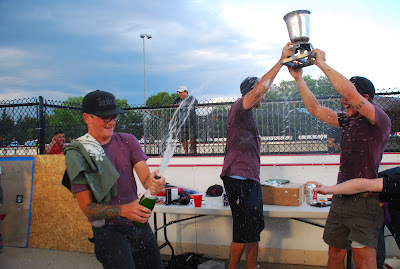 This thing we call bike polo is unique in that (up to this point) it's been so casual that concepts like a ruleset or dedicated referees have eluded us. But as we transition from a just-for-fun game to a ever-so-serious-and-competitive sport even the subtle differences have a big impact. Case in point- Warlocks. Their facebook page just launched yesterday and is already on the up and up. Familiar faces banding together to form a new superteam is always gonna garner a good deal of attention, but what particularly caught my eye is the way in which they're doing it. A quality team photo, team page, team logo, and a sponsor that's already promoting them. Suffice to say- they're doing it right. People like following teams. They like knowing who's on the court just by glancing at the color of their jerseys.. hell, it's taken years for people to get around to even wearing jerseys! Even arguely-the-best-team-in-the-world the Means got themselves a team page! It might seem mundane at first but that's the kind of thing that shows a team is serious and gearing up to do more in the coming year. That's also why whenever i see new (serious) teams like the Warlocks popping up not only does it make me happy, but it assures me that polo really is going places. The European have arguably been better at this than us Norteamericanos. Of course everybody knows of L'Equipe. Then there's been the rise of Iron Ponies and the Swiss battle for supremacy. 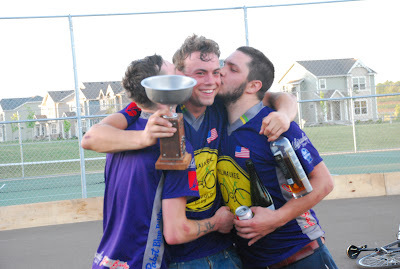 For years Team Cosmic has been slaying tournaments and preaching their purple gospel of cosmic puke all across the poloverse. It's fun, it's visual, and it makes polo more relatable for both players and fans. I've never even met those guys but anytime i'm following a European event i check in to see how Cosmic is doing. That's the strength of branding. That's also why great teams like Spring Break, Dead Rappers, Cocorico, and a host of others have been making waves over the past year. Now, i kinda hate the term branding cause it's a loaded term that implies you're selling something, but that's what i'm getting at here. Maybe "thematic continuity" would be a better term. Take my own team- Tree City. We're not the greatest team in the world, but we're pretty decent and always getting better. Nevertheless if you're from the Midwest you probably know us. Tree City is a synonym for our home town of Bloomington where trees are treated like citizens and a dense canopy covers the whole city. Of course it's also a reference to the *ahem* trees that we regularly enjoy, and if you know us off the court the whole theme makes perfect sense. We've even been using the same grease and blood stained jerseys for years that are long overdue to be replaced. We also practice together, travel together, win and lose together. Maybe i'm just lucky to have such great friends who are such dedicated polo players, but i think what we have is gestaltic- that the whole is greater than the sum of it's parts. We're better because we've banded together in a deeper sense than "hey let's play together for that tourney and come up with a potty mouth team name". Not that that element will ever go away, just that i think everyone benefits when we strive for something greater. Another example- in 2009 at the Midwest Championship in COMO there were only a few dedicated teams. The final match was an epic struggle between Machine Politics of Chicago and the Beaver Boys of Milwaukee. Unlike most of the teams that were assembled just for that tourney these guys had been playing together for years and continued to play together for years afterward. At successive Championships we continued to see the epic rivalry between these two teams, with the Beaver Boys coming out on top in successive years, even culminating in a World Championship in Berlin. Machine Politics didn't fade into the dark though- even as Lefty Joe moved westward and Matt Lane was replaced by Robbie Eccles the team found a new birth as "Clobber Politics". They made a great showing at this past year's NA's then exploded on the final day of Worlds in Geneva to eventually reach the podium of the biggest event in the poloverse. These are perfect examples of teams, in every sense of the word. Not just some guys who banded together for a single event, but those who made a commitment to each other to work together in the long term. Not only did it benefit them as players and a team, but it helps the sport as a whole. I'm just brushing the surface here and we could talk about this all day long, but suffice to say that i'm excited to see the community embracing this "team element" so early in the 2013 year. Some people like Capt Jake from Milwaukee are already way ahead of everyone on this subject- the MKE club has had legit cycling jerseys for the past two years and are currently designing their kit for next year! Sean from Fixcraft helped a lot of people out this past year by producing team shirts for teams like the Guardians and Fluffy Ducks to help them out on the court. That's the kinda direction we need. THE MEANS ARGUABLY THE BEST TEAM IN THE WORLD??? MAYBE IF THEY GOT RID OF THAT ONE TURD AND PUT IN SOMEONE RELEVANT. ALEXIS MILLS AND NICK VAUGHN ARE ARGUABLY THE BEST TEAM IN THE WORLD BY THEMSELVES. I WONDER IF ANYONE HAS EVER WON A TOURNAMENT WITHOUT FIRST HAVING A FACEBOOK PAGE? new chitown polo site, if you could update that under your regional polo links! thanks! This article must be an elaborate joke to get someone to ask what's wrong with Pedalphiles. @anonymous - yes of course you don't need a facebook page to win. what i was trying to say is that things like a team page, real uniforms, or a good name is a signifier that a team is serious. and yeah, serious teams tend to win more than casual teams. there's exceptions (lomax/williams/rob vs. canucks at NA's comes to mind) but even a quick glance at the Podium archive shows that it's not the rule. north face outlet online A bulging north face outlet locations belly, face Zeng light watt light, looking like a civil servant, but rather like an upstart. north face outlet online However, this person most suitable for them, because such people money, because the greedy will receive their money doing things for north face outlet store themselves. Director Chen. cheap pulled his arms wrapped, north face outlet online then opened thirty bills stacked neatly emissions exposed out. What do you mean. Director Chen asked coldly. cheap laughed within herself, from the earlier he would north face outlet online pay attention to the Director north face outlet online Chen's eyes.